Michael, David and Patrick McDonough enjoyed a chat with Alderman Todd Stroger at Plumber’s Local 130 in Chicago. 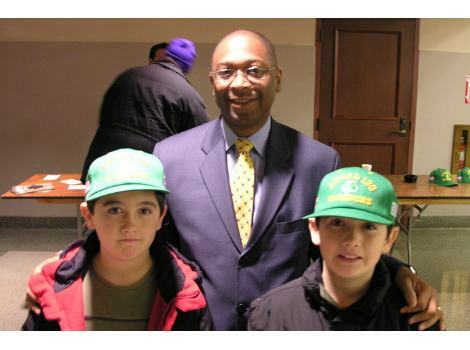 I must say Todd Stroger, (Alderman 8th Ward Chicago) the son of former Cook County President President John Stroger Jr. was very kind to my sons and I. Todd is in a very difficult race against Commissioner Tony Peraica for Cook County Board President. This is a typical Chicago Political Clout and Democrat Machine Candidate vs. a credible outside reformer. Unless the ballots are again rigged, I think we will have a great race. Since I did most of Tony Peraica’s photography used in his campaign, I know Tony Peraica brought the Political fight into Todd’s neighborhood. Photo by Patrick McDonough. HEY TODD,WHERES MY MONEY YOU WERE GOING TO GIVE BACK? I gave it to Peraica he needed it more than me. Previous PostPrevious John Daley gets a real Catholic Competitor for 11th Ward Cook County Commissioner.